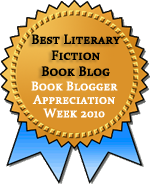 ← Sunday Salon: Blog Anniversary! 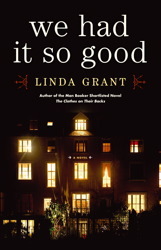 Having seen some good reviews of Linda Grant’s new book, We Had It So Good, when it was published earlier this year in the UK, I was excited to get an advance e-galley through Simon and Schuster’s Galley Grab program in anticipation of the US release on April 26. I’d not read any of Grant’s books before, but I’ve wanted to ever since her last novel, The Clothes on Their Backs, was shortlisted for the Booker Prize. We Had It So Good is on one level a multigenerational family tale, that family being the Newmans: Stephen, the American who came to Oxford as a Rhodes Scholar in the 60s; Andrea, the Oxford student who marries Stephen partly so he could stay in England after being dismissed from Oxford; Marianne, the elder daughter who becomes a photographer in Eastern European war zones; and Max, the younger son whose childhood fascination with magic tricks turns into an unlikely career. There’s a sense, though, in which this family represents the passage of time between generations, with a focus on the generation that came of age in the sixties. It’s no surprise that most of the ideas Stephen and Andrea’s compatriots throw in the air don’t actually fly. Ivan himself ends up working in advertising. Marianne and Max can’t even believe that their parents lived in a London squat, manufactured acid, or did anything of interest. Stephen and Andrea are the picture of convention, perhaps even of selling out. They’re comfortable, but they haven’t lived up to their promise. (This promise is in part embodied in Stephen’s fellow Rhodes Scholar, Bill Clinton.) And so their comfortable life carries with it a taint of discontent and disappointment, and in the end, the comfort they’ve chosen doesn’t protect them or their children from the pain they’ve attempted to avoid. The only person who stays true to the sixties life is Andrea’s friend Grace; her wanderings—all recounted in the first person, as if to therapist Andrea—represent the alternative to the conventional life that Stephen, Andrea, and Ivan have chosen. But she’s also a cautionary tale, as her life is never a happy one. Grace’s voice keeps the book from feeling like a romantic look back at the sixties. I almost couldn’t help put admire Grace for standing by her convictions, but mostly I just thought she was daffy and needed help, a lot of help. The sixties generation at the core of the book influences and is influenced by the generations before and behind them, but that influence only extends so far. Every generation must assert its own independence. So the young man whose father proudly tells of how he came to America looking for opportunity eventually returns to the old country. The little boy whose parents take him in for surgery to correct his hearing loss becomes oppressed by noise and ends up marrying a woman who is deaf. Even the younger nation that is the US attempts to disentangle itself from the older one. But the choice to rebel or merely to step back still means letting the past have a say, even if the past’s message is one of what not to do. And as it turns out, the one character who makes almost a complete break with the preceding generation is, in his old age, haunted by the world of his birth. We’ve been terribly lucky, you wonder whether the luck is about to run out, but we’ve had it made. I don’t know what we could have done to transform the world, when it had already been transformed for us. The people who won the war and made the peace did that. It’s a hard fact to swallow, for us I mean, our generation. Although the sixties weren’t completely dissimilar in the US and the UK, I wonder if this idea of being so lucky really translates. Young adults in the US in the sixties faced the specter of the Vietnam draft, which Stephen neatly escapes and hardly thinks of again. I can barely think of the sixties in the US without thinking of Vietnam, the protests against it, and the ensuing violence. I don’t think this difference should prevent the book from being interesting to US audiences. The generational tensions explored in the book are certainly universal, and even if those elements weren’t present, there’s pleasure to be had in reading about different nation’s experiences of similar eras. Wonderful writing in a wonderful review, and I can’t wait for the book to hit the shelves! Thank you, Chelsea. It is a really good book. There’s definitely a lot of crossover between the US and UK experience of the 60s, but I found the differences really interesting because I hadn’t thought about that before. (I was born in the early 70s, so I didn’t experience either personally.) But the interaction between generations is equally interesting, and I really liked the way Grant dealt with it. But does it leave you with the sense that the ideas of the 60s were unrealistic? Because it sounds like Grace is supposed to embody the 60s and she’s not getting such great press. I’m the author of this novel and you make a good and relevant point. You are quite right to say that the British experience of the Sixties was different. Some research has been done which demonstrates that those born in 1948 in Britain were the luckiest people who ever lived. They got the Welfare State, the National Health Service, the grammar school system, the expansion of higher education, the music and the fashion in the 60s, and reached retirement just before the recession. National Service ended in, I think 1959, so this generation did not know the draft. This was something I was very conscious of in the first few days after 9/11 when I think many of us assumed that London was the next target. That we had been immensely lucky to survive so long without being subject to the external forces of history. I am a little, but not much, younger than the characters in this novel, and I felt that our placid luck – that of my generation – was about to run out. However most of the ideas that Stephen, Andrea, Grace and Ivan talk about come from the US, America was the place where feminism, the civil rights movement, the anti-war movement, the drug culture – indeed the whole idea of the counter culture came from. And these are very much the ideas which shaped us in the Sixties, when I was a teenager. This is the reason why the central character, Stephen, is American. He embodies belief in progress and the future, but must escape America to avoid the draft, always longing to return. America is the place of both yearning and fear in this novel. I don’t think I could have written a novel about the baby boomer generation without the US being a major part of it. What I’m looking at really is the idealism of the baby boom generation, its sense of itself being special, and I think that was true on both sides of the Atlantic. Thank you so much for commenting, Linda! I really appreciate your insights into the different experiences of the 60s. I’ve always thought of it as a time of great dreams, but equally intense fear here in the US. It seemed to me like the characters in the book had all of the dreams but without that fear hanging over them. I found that difference really interesting, though of course, as you say, many of their dreams and ideas were informed by movements in the US. I love when books cause me to look at things in a new and different way, and your book certainly did that! I have this book to read and am looking forward to it very much! I do hope you enjoy it. I found it a great read. This sounds like a good book. I’ve always wondered what Boomers thought about how many of them “sold out” in some respect. Onto my TBR list this goes! I really enjoyed it, and the characters all had different perspectives on whether they had “sold out” and how they felt about it, which was nice.